"I would rather earn one percent off 100 people's efforts than 100 percent off my own efforts"
Is This How You Are Planning Your Retirement? Have you ever wondered how are you going to pay your bills when you stop working today? Before the water systems was modernized, people had to bring buckets to collect water from the rivers or wells to their houses. Burke Hedges, in his book "Parable of the Pipeline", explains that going to work is a similar phenomenon. If you have a job or profession or even a traditional business that requires you to trade your time and talent for money like Bruno, you essentially work each day to "fill a bucket" with money. Getting a better position or deal still requires you to trade your time and talent for money. It will only give you a fuller bucket. The moment you stop working, you stop earning money! Wouldn't it be better and smarter to build a pipeline like Pablo and have money flowing into your life even when you've stopped working? Bruno the Bucket Carrier or Pablo the Pipeline Builder? Please right-click over this 10 minutes long 'Parable of the Pipeline' video to control it. This is a classic story of two friends, faced with a business challenge, and their different approaches to that challenge. The challenge was getting water from the top of a mountain, to the village down below and be compensated for their work. Bruno took the traditional route to solve the problem. He carried bucket after bucket, made trip after trip, and earned his keep. So he started working harder. And he earned more money as a result. Pablo after taking the traditional approach for a while, decided to stop and think about how he could be more effective. He decided to build a pipeline. His work took much longer. His income reduced greatly, as much of his time was spent building this pipeline. Everyone called him crazy. Even his friend, Bruno with the buckets. Two years later, the pipeline started to work. Water started to flow. And so did Pablo's income. He was able to stop working, but have money coming in to him every day. While his friend, Bruno with the buckets, was stuck with his job… and stuck with no income if he stopped working. This metaphor describes Bruno, the traditional 9-to-5 employee, versus Pablo, the entrepreneur who builds a system which can generate passive income. 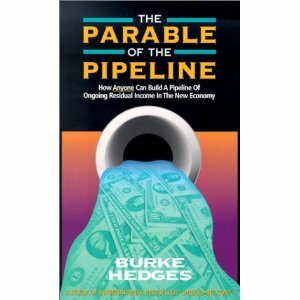 Burke Hedges' Pipeline Parable for your reading pleasure. If you work a 40 hour week at $30 an hour for 50 weeks a year, your productive hours are 2,000 or $60,000 a year. This translates to only 80,000 (2,000x40) income generating hours or $2,400,000 ($60,000x40) for 40 years of your working life. Can you afford to stop working with what you are doing today when you have to keep on paying for a house, car, food, clothing, medical bills, education for your children and holidays etc.? Base on the CPF LIFE Payout Estimator, the monthly pay out works out to be around 0.55% of Retirement Account Balance for a male at age 60 (less for a female because of longer life expectancy). In short, if you are in a position to invest say, $100,000 in your CPF Life account at age 60, you will get around $550 monthly... from age 62 for the rest of your life. The future looks bleak for the majority of Singaporeans and PRs who do not have the $100,000 with the CPF and without other income sources to subsist after their retirements... unless they start building their streams of passive income. 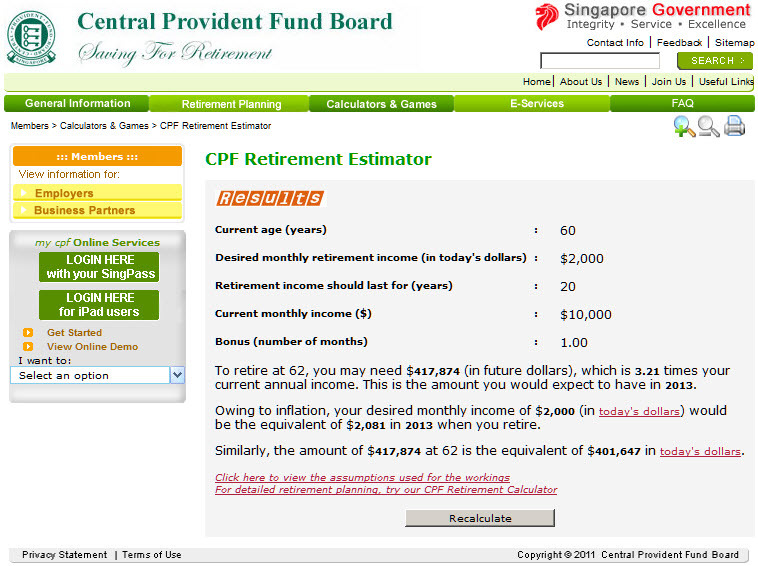 To those who are better off financially but have yet to plan for your retirement, you might want to use the CPF Retirement Estimator to find out if you are indeed as financially well off as you assumed to be after your retirement. Note: You will need to save twice as much i.e. $834K if you have a dependent spouse to care for. 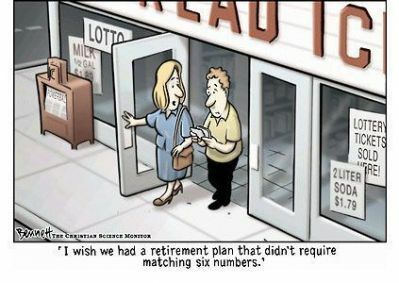 Will you have the disposable assets to maintain the lifestyle you desire after your retirement? If your answer is No, then you need to do more than what you are saving today for your retirement! The problem is that there is a limit on what you can earn alone during your productive years. Moreover, as a bucket carrier, your income stops the moment you stopped working! What if you can build once, a 1,000 strong team working just 4 hours per week and contributing to your income? Wouldn't you get to enjoy the same 80,000 (1,000x4x20) income generating hours in just 20 weeks and the same $2,400,000 (80,000x$30) from your team? With your team in place, you can take frequent breaks, go on extended vacations, eat, play and sleep well, knowing that your team will continue to work to contribute to your income! Now, which do you think: bucket carrying or pipeline building is the better option to pay your bills and saving for your retirement when you have to stop working someday? How can I get out of the Rat Race? Would you like to be able to earn a lucrative income similar to the collection of monthly rentals without owning properties and no recurring costs to worry about? Now you can... and it is absolutely FREE to get started as an Affiliate with . 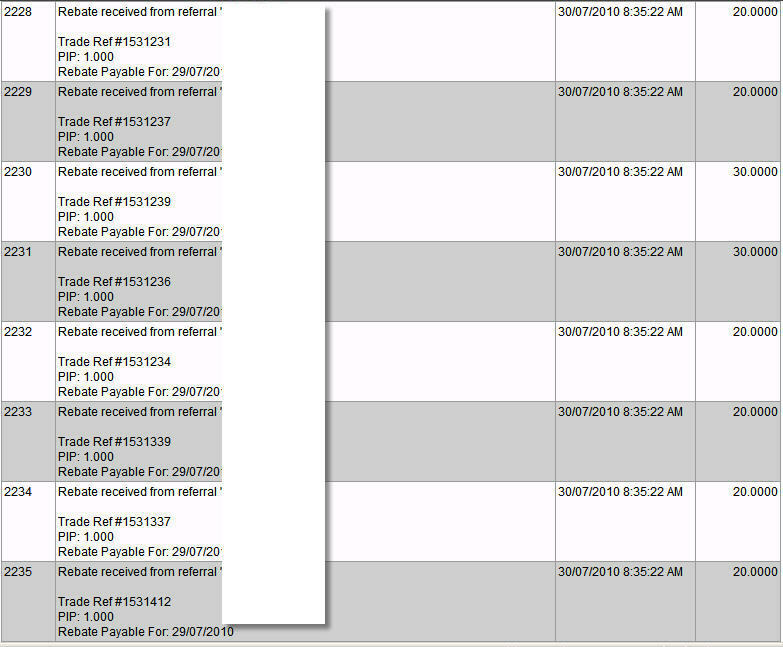 A screen shot of my trading commissions in US$ as an IB with Fxprimus on a good trading day. As a Pipeline Builder, I worked once to sign up my traders and affiliates. The more traders and affiliates I signed up, the more trades that my traders execute and the more traders my affiliates brought in, the larger will be their contributions to my recurring income streams. Unlike the 24 hours a day constraint on active income of a Bucket Carrier (employee/professional/traditional business owner), there is no limit to what a Pipeline Builder can leverage to earn from his/her passive incomes. In addition, the Pipeline Builder can choose to stop working with no worries on how to pay his bills! Fxprimus offers TRUE bank feeds, tight spreads and executable prices. Fxprimus does not trade against your clients. Your trading friends will thank you for introducing a trading partner that levels the playing field for them. You need to work hard once and get paid over and over again. The potential to recruit your own affiliates to multiply your income as an IB. While internet based businesses offer you easier ways to gain the power of leveraging of money, time and technology to create residual income without any of the hassles of setting up or running a traditional business, only you can offer your Commitment to make things happen! No matter how many past regrets and failures that you may have, you can always start anew and afresh. There will always be an opportunity cost for any delay as a result of inaction. We will guide and help you along the way because in our kind of businesses, we succeed when you become successful! Why just work hard when you can also work smart? 3 Principles to build an Income Pipeline. They are: Leverage, Residual Income and Commitment. Leverage is when you set up a system that pays you more money than your personal time and talent normally would. Products/Services are being sold and you are being paid, but you are not the only one doing all the work. Residual Income is when you do things once and you get paid for them over and over again. Commitment is when you keep on laying more and larger pipelines until the trickles of water turn into an avalanche of waterfall. And... don't quit until you have succeeded! The truth is that the harder you work to share your outstanding products/services, the easier it will become and the higher shall be your returns. Don't just carry buckets when you can also build pipelines!